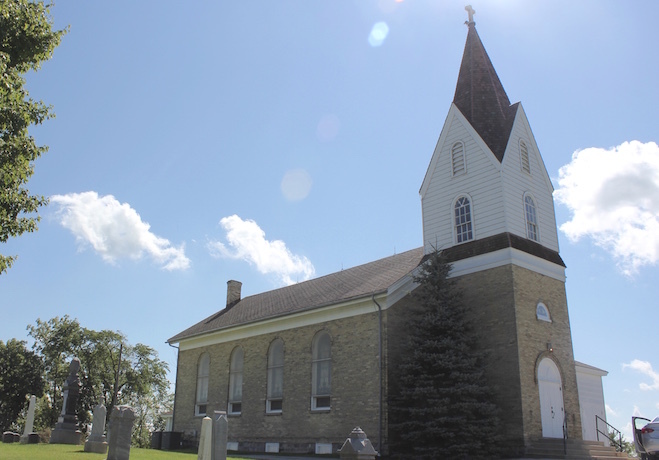 On Saturday and Sunday, Norway Evangelical Lutheran Church will celebrate 175 years as a parish. Started in 1843, it was the first congregation of the Norwegian Lutheran Church organized in the United States. The church is at 6321 Heg Park Road in Wind Lake. In celebration of 175 years, lifetime parishioner Donna Hanson wrote a historical remembrance of the church. It includes information such as a list of the church’s former pastors and the history of the three churches that have been used on the grounds. The “Remembrances” packets will be distributed on the weekend of the anniversary. “The Norwegian settlers came in the 1830s. The settlers wanted land for farming. Norway didn’t have much land opportunity and was very mountainous,” Hanson said. The first log church was built by hand in 1844 by Norwegian settlers. The parish quickly outgrew it, and in 1904 the historic building was moved to Luther Seminary in St. Paul. The second church, called the Church on the Hill, was built in 1869. It is still used for Saturday masses during the summer, as well as for special occasions such as weddings. The basement of the Church on the Hill contains documents and artifacts pertaining to Norway Evangelical Lutheran Church’s history. The third and newest parish unit was built in 1953. This church is still being used today for services and events like Sunday School. The church currently has a youth program, Bible studies program, choirs and more. “This church is hungry to see what they can do. We don’t only welcome Lutherans, we welcome all denominations. I sincerely mean that. We are always looking forward and progressing as a community,” the Rev. Mark Jaramillo, pastor, said. Pastors Kristie and Mark Jaramillo are married and have preached together for 19 years. “I go to work each day and pinch myself that I get to work for this church of people. It’s so surreal,” Mark Jaramillo said. The church currently has about 1,400 parishioners. Hanson said a committee has been preparing for the 175th anniversary for the last four to five months. At the services on Sep. 8 and 9, Greater Milwaukee Synod Bishop, the Rev. Paul Erickson, will be preaching. On Sunday, services will start at 8 a.m. and 10:30 a.m.
“The masses will also have special music including our praise band, choir and bell choir,” Hanson said. “Everyone is welcome at this celebration,” Mark Jaramillo said.